Our eight-year-old daughter turns up her nose at only a handful of foods, notably spinach, ham, clams, and Brussels sprouts, which I adore and she dismisses as “round green things.” But last night my husband and I discovered the only food that actually brings our child to tears—eels. Eels, ready to be cleaned and skinned. I’m not especially fond of eels either. The flavour of this sinuous sea creature is too dark for me, rich and oily, with a hint of malevolence. It’s also the sort of food I associate with medieval banquets. Perhaps I’m imagining these drawbacks. Maybe my disdain is merely a primal abhorrence, related to my fear of snakes, which is only natural for Southerner. I am told Italians, however, love eels, especially at Christmas, which is why you can find them easily in the winter in any city with a significant Italian population. A Boston-bred college friend of my husband’s recalls his grandmother keeping a bin filled with live eels in her basement during the holidays. Frankly I don’t like the look of eels. But I will taste them, even just a bite, especially when I arrive home to find my husband pondering an eel recipe out of Mapie de Toulouse-Lautrec’s La Cuisine de France (Orion Books, 1961). He planned to serve bouilleture d’anguilles à l’angevin, or boiled eels in the Angevin style, which means, to the best of my knowledge, cooked with white white from the Loire Valley. The word Angevin relates to the Angevin empire, a Plantagenet swath that covered most of coastal France and England in the 12th and 13th centuries. (See, I told you eels had a medieval aspect.) 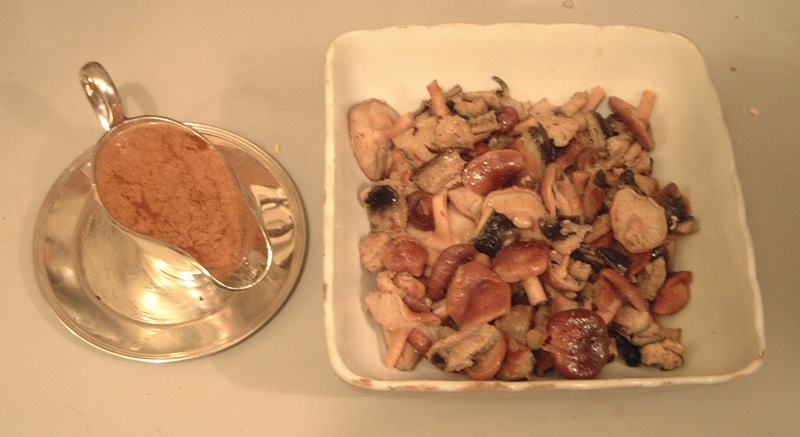 The dish includes mushrooms too, presumably the button variety (Mme. de Toulouse-Lautrec doesn’t specify) but my husband brought back from the market the kind of attractive, broad-topped, earthy mushrooms I associate with woodlands and fairy tales. The boiled eels made their way to the table with a side dish of green beans cooked in butter and sprinkled with sliced almonds. Our daughter, tears welling in her eyes, took one bite of the main course and asked to be excused from the table. I took two bites and then focused on eating the buttery mushrooms and green beans. My husband, however, cleared his plate, had seconds, and pronounced the eels good. There’s just no accounting for taste. 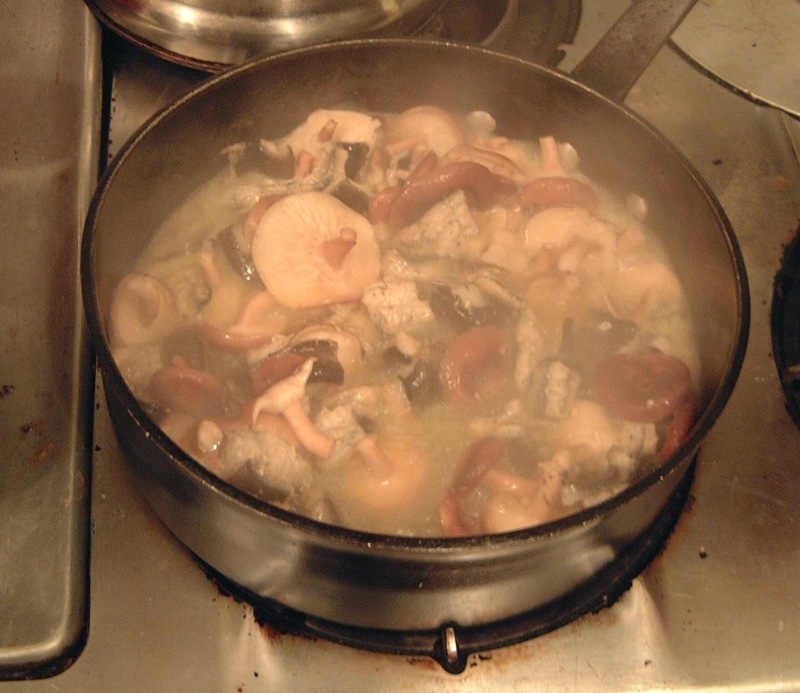 The eels and mushrooms cooking in their broth. Skin and clean the eels and cut them into 1-1/2-inch pieces. Throw away the heads. Put the butter in a large pan and add the eels and the raw mushrooms, trimmed and washed, left whole or cut in pieces, depending on size. Cover the pan and heat slowly for 5 to 6 minutes. Add enough wine to cover the eel pieces and put the pan on high heat until the liquid boils. Reduce the heat and simmer 10 minutes. Remove the eel pieces to a heated serving dish with a slotted spoon. Cover to keep warm. Boil down the liquid rapidly to half its original quantity. Add the cream and beat the sauce with a fork for a few moments without letting the mixture boil. Season to taste with salt and pepper. Pour the sauce over the eels and serve immediately. The completed dish, with its creamy sauce, ready for the table. This entry was posted in Uncategorized and tagged Eels, Fish Dishes, Mushrooms. Love the title of this post! Hahaha! I don’t blame Catherine for being a little squeamish, but I suppose it could be incredibly delicious. I saw somewhere that there are tremendous health benefits to eating eel. Live in a Federal-era house, and eat food of the same period. Makes sense to me! We caught one as children fishing in Maine. Our guide chained it to a rock, where it took all afternoon to die. But it was delicious in memory, cooked on a fire. YIKES!!! Okay, that childhood experience might leave me with a nightmare or two. I’ve never eaten eel, but I’ve used live eels as bait and I can’t say that it ever gave me much of an appetite for them. Nasty little buggers, really. Still, kudos for trying them — a raw oyster doesn’t look like much either, but where would we be had no one ventured? Oh, dear. I had a miserable and overwhelming experience with an all-eel restaurant outside Venice which a vendor insisted he take us to… it was my great Italian-undoing. Cannot look at eel since… no, but thank you for sharing! I’m even more creeped out by the eel-cleaning process. Apparently the easiest way to skin them is to nail them to a wall and then use pincers to peel the skin off. Or so we were told. We did not attempt this. I’ve had eel. There’s quite an industry here on the Chesapeake where the watermen catch them and then they’re shipped to European capitals. I was at a hunting lodge on the bay and we had an eel pot and the cook prepared them on the grill. They tasted like chicken. Perhaps grilling would be better. My husband insists that is the best way to prepare them and they are, indeed, delicious. 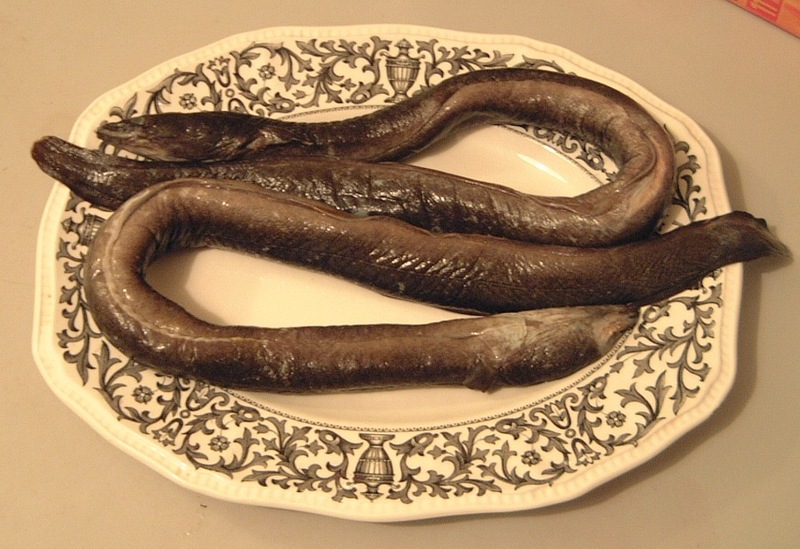 I’m with you on the Eels, Aesthete, my stomach turns just looking at them and please remind the spouse that Henry I and his grandson Eustace, among others, choked to death on eels. Maybe he likes to live dangerously??? Perhaps they choked because of the gag reflex? I do not find them delicious! The provenance of the eel is very important. A freshwater eel must come from clear running water. Those from muddy streams may taste muddy. Eel at its best (in New Zealand anyway) is a white (not oily) flesh with a subtle flavour, and suits quick and delicate cooking with a fragrant wine such as a Gewürztraminer and perhaps shallots with the best butter and finished with a light stock. Peanut butter is always a great pacifer, I have found. Especially the chunky variety. Years ago when we still lived in the Netherlands I acquired a taste for eel. Along the beaches at Scheveningen where I worked at the time there was always a van selling fresh bread rolls filled with raw herring, smoked fish, or raw eel with chopped onions. I must admit, it was a bit disconcerting seeing an eel brought writhing from a barrel, beheaded and skinned whilst still wriggling and then within seconds be placed on bread. Delicious raw, but cooked …. there I’m with your daughter! I don’t think I could look raw eel in the face.